First published in 1975, Empire of the Petal Throne was the second roleplaying game published by TSR, Inc. and the third fantasy roleplaying game to be published, yet it was the first in so many ways. Mechanically, it might have introduced the concept of critical hits, but it was the first roleplaying game to come with a setting, the first roleplaying game to come with its own languages, the first roleplaying game not to be based upon West Europe mythologies but rather Asia, Central America, and Egypt, and the first to come with a campaign concept. That setting is in the very far future on Tékumel, a metal poor planet which has been isolated in a pocket dimension for at least fifty thousand years. Societies on Tékumel are culturally sophisticated if very tradition-bound, but technology has regressed to medieval levels, although relics of the past, notably the metallic, gem-shaped ‘Eyes’, can be found and used, some emitting healing rays, others destructive or freezing beams. Knowledge of their manufacture has long been lost, but Magic is known, its Sorcerer practitioners drawing upon dimensions beyond for its energies or Priestly practitioners petitioning the gods directly, for on Tékumel, the gods are very real and any disbelief in them is viewed as an aberration. In the five human empires—Livyánu, Mu′ugalavyá, Salarvyá, Tsolyánu, and Yán Kór—there are ten gods and ten cohorts, divided equally between the Tlomitlányal, the Gods of Stability, and the Tlokiriqáluyal, the Gods of Change, their followers constantly jockeying for power and influence. Tékumel is the creation of M.A.R. Barker, a professor of Urdu and South Asian Studies and as much as it is a fantasy world, Tékumel is an exercise in linguistics. The designer created numerous languages for the world, Tsolyáni, for example, being inspired by Urdu, Pushtu, and Mayan. It should be noted that although knowing how to speak Tsolyáni has never been required to roleplay in the Empire of the Petal Throne, knowledge of some of the terms is useful. That said, the linguistic adjustment necessary to pronounce a great many of these terms has always proved to be off-putting for some gamers. The campaign concept is that of ‘Fresh Off the Boat’. The player characters are the equivalent of ‘country bumpkins’, distant cousins who sail ashore at the great Tsolyáni port city of Jakálla and set out to find a place in civilised society. At first they are confined to the Foreigners Quarter, but sooner or later, one of the great clans of Tsolyánu will seek to employ them, sending them off on deniable tasks, perhaps down into the Underworld of built over ruins located under the city. Eventually, their efforts will be recognised and the patron clan will sponsor them for membership of a clan and so allow them to gain citizen and value in the Five Empires. This is very different to the simplistic campaign concepts of the period, which amounted to little more than going down a dungeon, killing the inhabitants and taking their treasure. If such games were about going off and being outsiders, Empire of the Petal Throne was about outsiders earning acceptance and recognition. As a campaign concept, ‘Fresh Off the Boat’ is a clever set-up. It introduces everyone—Referee and players alike to the setting of Tékumel without overloading them with its complexities and subtleties, pulling them both into the society rather than excluding them. Of course, in later iterations of the setting, roleplaying on Tékumel focused on playing citizens and clan members, but in Empire of the Petal Throne, none of these clans are specifically named. 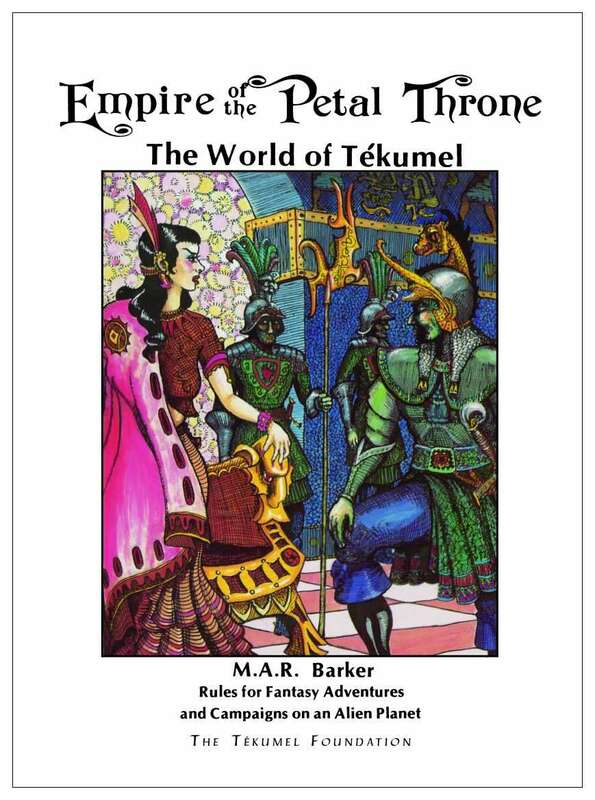 Now Empire of the Petal Throne has been out of print since 2001, but in 2017, the Tékumel Foundation has reprinted it. Unlike the original edition from 1975, it does not come as a thick spiral bound book in a colourful box, accompanied by vibrantly coloured maps and high production values. Instead it comes a single volume which reproduces everything from that version in black and white. In addition, it includes introductions from both creators of Dungeons & Dragons—E. Gary Gygax from the 1975 edition and Dave Arneson from the 1987 reprint from Different Worlds. In all other ways, the Tékumel Foundation edition of Empire of the Petal Throne is a perfect facsimile of the original edition. This includes crisp reproductions of the heavy line art and the accented language and terminology. Amounting to more pages than original 1975 version, its slim size is indicative of just how thick the paper and how high the production values were in that edition! Once past the introductions by the hobby’s leading lights, Empire of the Petal Throne leaps into a description of Tékumel and its history, ultimately focusing on Tsolyánu and its current political situation—internally and externally. Primarily this is that the current incumbent of the Petal Throne, Hirkáne Tlakotáni, is old and the various political parties and temples are already attempting to manoeuvre their preferred candidate—each one fathered by the emperor—in readiness for the competition to see who will succeed him. Meanwhile, to the north, the Baron Áld, commander of the forces of Yan Kor and Saa Allaqi, has sworn revenge upon Tsolyánu for the death of his mistress and is said to have in his possession an ancient and unstoppable weapon. (Much of this is detailed in the novels, Man of Gold and Flamesong.) Of course much of this will be of little import to characters who are just Fresh Off the Boat, but to the Referee this will be information that is probably going to be important to the patrons who might hire the player characters. Empire of the Petal Throne is a Class and Level game with just three character professions—Warrior, Priest, or Magician. All are Human. Just as in Dungeons & Dragons, they have an Alignment. This is either Good or Evil—there is no Neutral—and reflects their loyalty to either the Tlomitlányal or the Tlokiriqáluyal. Now it should be noted that unlike future presentations of Tékumel, here the Tlomitlányal are termed the good gods and the Tlokiriqáluyal the evil gods, rather than the gods of Stability and Change. A character has six talents or attributes—Strength, Intelligence, Constitution, Psychic Ability, Dexterity, and Comeliness. These are rolled as percentiles in order and this being an old school roleplaying game, are kept and kept in order, no matter the result. Fortunately, as a character goes up in Level, he will be able to improve his stats. In addition, a character has two types of skills. His Original Skills are background skills, like perfumer, slaver, or orator. These are grouped into Plebian, Skilled, and Noble skills and a player simply rolls for the number his character knows. The results can be very random, but the player chooses what they are. Professional Skills are rolled for and selected in a similar fashion. Like Dungeons & Dragons, characters in Empire of the Petal Throne have Hit Dice and this is the same for each profession—the six-sided die. Overall, character generation is quick and easy, taking a few minutes per character. One thing that hampers this is actually a lack of Tékumeli or at least Tsolyáni names. By modern standards, this is a very odd omission, and even by the standards of 1975, a disappointing omission. Fortunately, these days a list of common names found in Tsolyánu is easily found on the Internet. Although there are skills, there is not a skill system as such. Really it is up to the Referee to determine the outcome or allow a roll against an attribute. For the Wizard and the Priest, many of the professional skills are actually spells and work like they do in Dungeons & Dragons. The magic system is ostensibly Vancian, cast and forget, again like Dungeons & Dragons, but some spells can be cast more than once per day and there is a chance of a spell not working when cast. The latter though lowers as a Priest or Wizard progresses in Level. Some spells look like spells from Dungeons & Dragons, such as ESP and Light, but others, such as The Grey Hand (instant death, no saving throw) and The Silver Halo of Soul Stealing, are more interesting and particular to the setting. When a character acquires a new Level, he gains more skills—both Original and Professional, and in the case of the Wizard and the Priest, bonus spells. In comparison, the skill gains for the Priest and Wizard roles are much more interesting than those for the Warrior. Combat in Empire of the Petal Throne looks very much like Dungeons & Dragons. Characters wear armour and have Armour Class, against which a twenty-sided die is rolled. Damage is rolled using six-sided dice, no matter the weapon used. Higher Level characters roll more dice against lower Level characters or opponents. Combat is fairly deadly, especially with the double damage rule for rolls of a natural twenty, as well as the vicious nature of some of the creatures found on Tékumel. Empire of the Petal Throne includes an extensive bestiary—backed up by various sets of encounter tables, covering creatures found on the Sakbe roads (the road-walls which divide and connect Tsolyánu), at sea, in the air, and in the Underworld. They include the horrid Ssú, which hate mankind and which smell of cinnamon and often have the ability to hypnotise mankind; the dragon-like Sérudla with their acid spittle; and the crab-like Ngrútha, which likes to insert its eggs in its prey. The majority of the creatures in Empire of the Petal Throne are illustrated in a heavy pen and ink style, which serves to give the book a very singular look. In terms of magic items and treasure, Empire of the Petal Throne takes its cue from Dungeons & Dragons, whether that is money, arms, armour, gems, jewellery, and so on. Yet it adds its own items with the inclusion of Eyes, amulets, books, and scrolls. These and their effects are highly detailed and really add flavour and bring out the weirdness of Tékumel, whether it is the Eye of Departing in Safety or The Eye of Ruling as a King in Glory, The Amulet of Perceiving the Scintillation of Metals, and Jnéshtlaq Kéq Yóssu or The Tome of Black Mold. The inclusion of scrolls and books highlight how important knowledge of the past is on Tékumel. One type of magical item that is absent is the potion, although alchemy is available as a skill. The rest of Empire of the Petal is not really a hodge podge of rules and discussion, but rather it just seems that way. There is everything present for a Referee to run a game—and more. Various sections cover detailed descriptions of both the Tlomitlányal and the Tlokiriqáluyal; taxes, relatives and bequests; building in Tsolyánu; and advice for the Referee, including developing scenarios and a sample snapshot of a section of the Underworld and an example of play. The ‘Fresh Fresh Off the Boat’ campaign is also discussed. These all feel as if they should in different places than where they are in the book, so the discussion of the ‘Fresh Fresh Off the Boat’ campaign comes before the encounter tables and not in the advice section for the Referee. Likewise, the map of Jakálla and its key of interesting place names is placed at the book, but does make for easy reference during play. It is not an insurmountable issue, but it would be something that a prospective Referee should get used to when running the game. Rounding out Empire of the Petal Throne are appendices that cover pronunciation, the Tsolyáni script, the words and script of the citizen document—a fine reward for any character in the long term, and a map and its key to Jakálla, plus the reference sheets included with Empire of the Petal Throne in 1975. Physically, for a forty-year old roleplaying game, Empire of the Petal Throne is well presented. The layout style is very much that of a set of wargames rules, but then that was the style of forty years ago—the industry does things differently now. It needs an edit in places, but the writing is assured and interesting. The artwork may look somewhat amateurish by modern standards, but it is striking throughout and some of the scenes depicted really help impart the rich and baroque nature of the setting that the game itself quite cannot. For the problem with Empire of the Petal Throne is that it is an Old School roleplaying game and it is predicated on dungeon—or Underworld—delving just like its mechanical forbear, Dungeons & Dragons. As much as the Underworld is an important feature of the setting, there is more to Tékumel than that. Of course, it would take later roleplaying iterations of the setting to bring that out and it really is unfair to criticise the design for not yet being what it become. This is after all, the starting point. Empire of the Petal Throne is not perfect, but those imperfections are but three in number. The first two are the aforementioned lack of personal names and Clan names. The inclusion of both would support the game in the long term and support the given campaign outline without the Referee needing to look elsewhere for more information. If there is anything that the Tékumel Foundation could have added to Empire of the Petal Throne, it would have been these names. The third is the description of the Tlomitlányal and the Tlokiriqáluyal as the gods of good and evil respectively. This simply wrong, but again an issue caused by the game’s development from Dungeons & Dragons. Of course, Empire of the Petal Throne is a piece of nostalgia, but it is surprising that this game is playable despite being rough around the edges, both in terms of the setting and the mechanics. A more modern gamer might want to look at other means of visiting and playing on Tékumel, rather than using this ‘relic’, but Old School players and referees will relish the slightly rough and ready feel of Empire of the Petal Throne. More support for this introduction to Tékumel would certainly be appreciated—perhaps a scenario or two, even a ‘Fresh Off the Boat’ campaign, if not a supplement discussing other ways to approach playing and running Empire of the Petal Throne. Of course, for Petalheads—as Tékumel fans are known—who do not own an original copy of Empire of the Petal Throne, then this reprint represents a chance for them to visit it for the first time, whilst for those that do, it provides a means for them to reference it without having to open their original copy. A discussion of the ‘Fresh Off the Boat’ campaign can be found in episode #1 of The Hall of Blue Illumination podcast. Empire of the Petal Throne is available in print as a hardback or softback, or as a PDF, from DriveThruRPG.